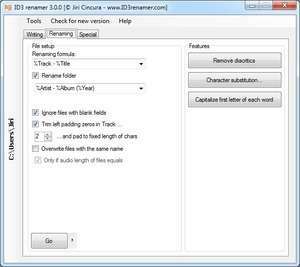 ID3Renamer is a small and lightweight freeware ID3 organizing program which quickly and effectively renames your MP3 ID tags based on whichever naming convention you choose. It features a tabbed and easy-to-use interface and features free updates from within the application. It includes a pretty smart system for naming and id'ing mp3 files and uses variables from within the ID3 tag itself to rename files based on specified parameters. It rewrites file and folder names using a formula, for example "%Track - %Title" and folders can also be done the same way like "%Artist - %Album - %Year". Version 7.2.9 is a freeware program which does not have restrictions and it's free so it doesn't cost anything. For security reasons, you should also check out the ID3 Renamer download at LO4D.com which includes virus and malware tests. Additional screenshots of this application download may be available, too.